Renovating and maintaining a period house can be both a blessing and a curse, and knowing when and how to reinstate original features can be a tricky path to navigate. But if you restore them with care and sensitivity, and find good suppliers, your home will be a joy. And the good news is that, once you get the bones right, your space can be as traditional or contemporary as you like. Do you have draughty, rattling sash windows? These classics, with a box casement and independent top and bottom units, are beautiful, but can also be a pain. If money allows, it’s really worth investing in double-glazed replacements, as the increased energy efficiency will repay you year after year. If your sash windows are in good condition, however, choose a reputable company to thoroughly refurbish and draught-proof them. Include cord replacement to ensure you get that satisfying ‘whoosh’ when you open and close them. Do choose any replacements carefully – a central glazing bar in both top and bottom sashes looks so much better than plain glazing, for example – and don’t be tempted to install cheaper uPVC over timber frames. If your property is listed, you might need to retain single-glazed originals, but these days it’s possible to source sympathetic secondary glazing that doesn’t hide the original windows. Don’t forget that listed buildings have many rules and regulations attached, so before you consider any of the ideas in this article, it’s essential that you seek the advice of an expert. Most period properties will have a combination of tiled and timber floors, and stripped wooden floorboards give a period house an authentic feel. Originally, these would have been stained dark to resemble mahogany, but go with what you love. If you need to replace rotten sections of board, first see whether you could take any from another part of the house where the floor will be covered. If you’re laying new wood flooring – whether you go for a solid or engineered design – consider the width of the boards alongside other elements of interior architecture. Boards that are too wide in a small room can overwhelm, but those that are too narrow can look mean. 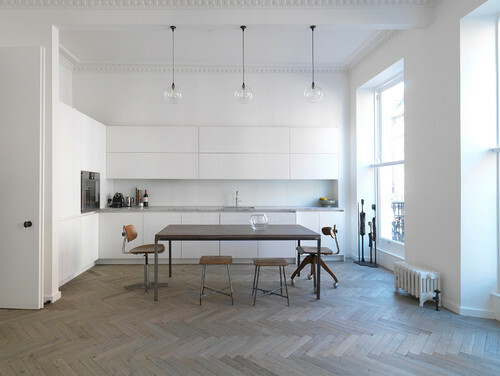 As an alternative, consider parquet, as these homeowners have done in their spacious kitchen, as it can be a striking complement to a contemporary scheme. If you’ve ever heard the interior designer mantra that fixtures and fittings are the jewellery of a room, you’ll know it pays to give them due attention. Apart from anything else, it makes sense to invest in decorative elements that you handle each and every day – door handles being the best example of this. The key to getting this right is to choose your finish and stick to it for all the fittings. For example, whether you go for antiqued brass, bronze, pewter or brushed steel, use the same finish on hinges, handles, cupboard knobs, light switches and window furniture. 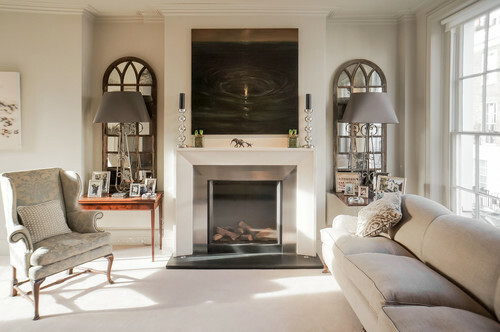 If you’re reinstating the surround of an old fireplace, it’s important to think about the materials you go for. Do as our ancestors did and choose marble, stone or cast iron for principal rooms, and either wood or cast iron for secondary or private spaces, such as bedrooms. As a rule of thumb, you should avoid removing the fireplace in a reception room. This is because it adds a focal point to the room and creates valuable air circulation in an old house. If your disused fireplace is draughty, you can buy inflatable chimney balloons that you fit to the inside of the flue. The main thing to remember when choosing mouldings is to match them all to each other within a specific period. For example, don’t choose a Georgian cornice and a Victorian ceiling rose. Remember also that they are there to enhance the proportions of a room. A Victorian terrace requires a simpler or smaller cornice, therefore, than a Georgian rectory. 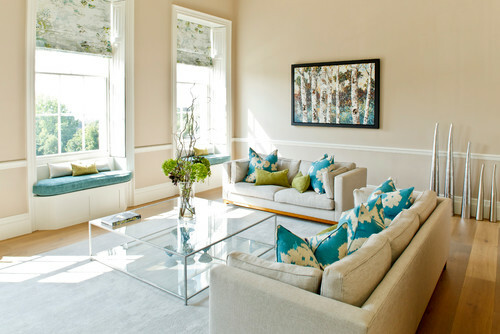 Picture rails should be set 30-50cm below the cornice, depending on the overall height of the room. A useful piece of advice is that mouldings should be alternately convex and concave when read top to bottom – easy to plan once you get your eye in. If you’re a real purist, or are renovating a listed property like this Bath home, then it’s important to think about dado rails. However, if you prefer your walls to be uncluttered, this is one piece of detailing it’s probably ok not to reinstate – it’s better to have a beautiful cornice and skirting board. 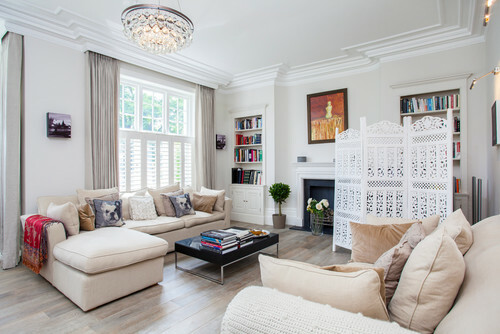 The original purpose of dado rails was to stop chairs from damaging the walls, so in a modern home with soft sofas and armchairs, they can be somewhat superfluous. If you decide to reinstate dado rails, consider having them installed slightly lower than tradition dictates, so your ceiling appears higher. The position of the dado rails in this beautiful living room is just above the seating level, so the walls stretch out to the ceiling and give a feeling of height. Elements such as skirting boards, architraves and ceiling roses should relate to the rest of the interior architecture. For example, a room with a dado requires a lower skirting board, while a high-ceilinged room can take a higher skirting board. And don’t be satisfied with a plain or stingy architrave – a slightly larger one makes a doorway feel wider and more considered. Once you know the rules, you’ll have the confidence to break them a little: you could choose a small yet pretty ceiling rose for a bedroom, for example, even though originally these would have been rather plain. It pays to do your research, and there are very good books dedicated to the subject. If all the details have been stripped out of your house, try asking a neighbour if you can take a look at any remaining features in theirs. The thing to remember with radiators is that your period house wouldn’t have had them originally anyway. You’re not actually reinstating anything, you’re simply looking to introduce a solution that’s either unobtrusive or aesthetically pleasing. If your budget is tight, then good-quality panel radiators are efficient and can be paired with more traditional cross-head valves. Paint them the same colour as your walls so they blend in – you’re not trying to make a statement with this design. 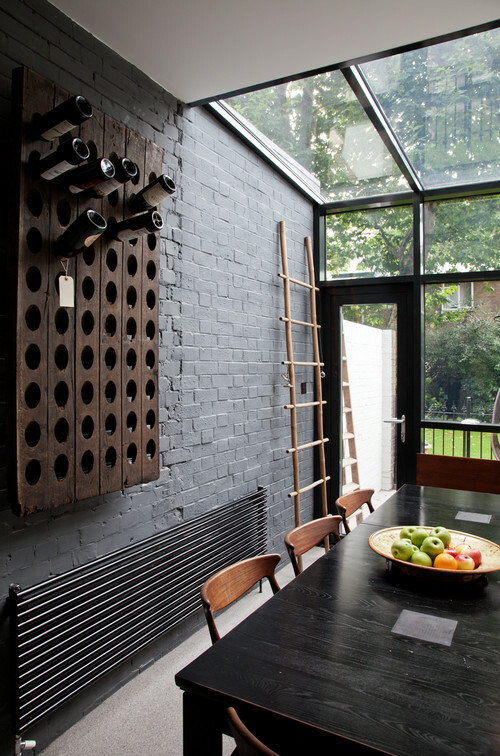 In a modern extension attached to a period property, very contemporary radiators look fantastic, as there’s no need to ape the original style of the house. Column radiators are a beautiful addition to a room, and are available at a number of price points. You can install a mixture of column widths – from two to four – depending on the heat output required.